It’s been a busy and exciting few months here at FIRE, with campus free speech and due process issues making headlines around the country. Now you can catch up on the most important FIRE news from the past few months all in one place. 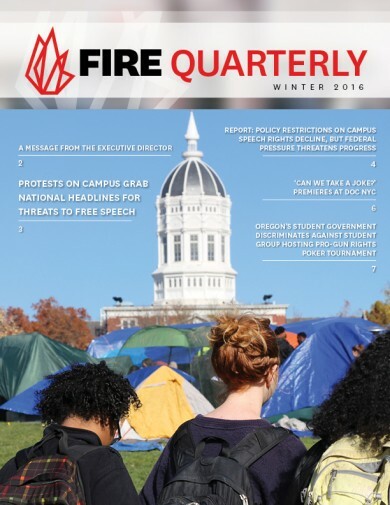 Today’s release of the Winter 2016 F IRE Quarterly gives you an opportunity to take a closer look at the important work we’ve been doing to ensure individual rights are protected on our nation’s campuses. Of course, we wouldn’t be able to do this valuable work without your support. As a “thank you” to our supporters, a donation to FIRE of $25 or more gets you a hard copy of the FIRE Quarterly delivered to your mailbox, or an e-copy sent to your inbox. Click here to view the full report online.